My wife just got her permit to carry and wants to get a handgun of her very own. She would really like to get a pink gun, or a gun that has some pink on it. Is there any web sites that you know of that cater to that type of gun where she could do some window shopping? I know you said this is for the ladies (not sure why) but a fair amount of manufacturers cater to that realm, Taurus for one. You could just google "Pink Pistols"
On topic, I don't know of any specific sites for pink handguns. Off topic, if she hasn't found http://www.corneredcat.com she might want to take a look. Can't you get pink grips for M&Ps? MrVvrroomm wrote: What time is lunch? I'm having a colonoscopy that morning at 1000. I'm sure I'll be hungry. XD/Dale wrote: My wife just got her permit to carry and wants to get a handgun of her very own. She would really like to get a pink gun, or a gun that has some pink on it. Is there any web sites that you know of that cater to that type of gun where she could do some window shopping? The decision to buy a carry gun should not be made on its color unless that's the last deciding factor. You can get any firearm duracoated or painted pink. I've seen pick grips for the Bersa. I think I saw a pink LCP too. My wife also just received her permit. I'd lime to find her a purple M&P. Tori Nonaka has a purple Glock. Thunder71 wrote: I know you said this is for the ladies (not sure why) but a fair amount of manufacturers cater to that realm, Taurus for one. 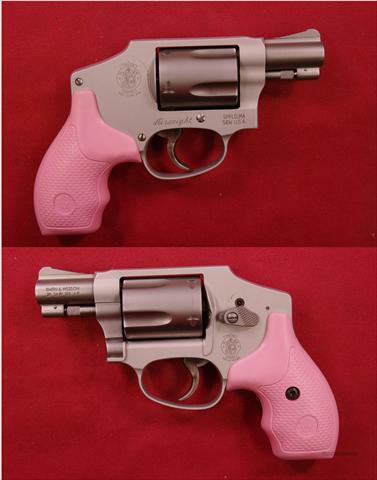 Thanks Thunder john, Shes been looking at the 738, I don't think we've seen the pink Kahr. Ironbear wrote: You could just google "Pink Pistols"
We have both goggled pink pistols I was just woundering if there might be something we might have missed. I showed her The Cornered Cat and suggested she do some studying there. We'll have to look that up, thanks. TH3180 wrote: Can't you get pink grips for M&Ps? I agree it should be the least deciding factor, not sure she agrees , again I'd like her to look up the Cornered cat to get a womens point of veiw in choosing a hand gun. I would like to stay away from painting a gun, not sure I like the look of Dura coat. Pezhead wrote: I've seen pick grips for the Bersa. I think I saw a pink LCP too. My wife also just received her permit. I'd lime to find her a purple M&P. Tori Nonaka has a purple Glock. Although shes never even held one, right now I think shes leaning towrd a nickle Bersa with pink grips. We were going to go to the last gun Show at the State Fair Grounds, but she got sick and couldn't take the two hour drive. I thought I would give her the best oportunity to see and handle a large amount of guns. That brings up another question is the next gun show at the fair ground large enough to warrent a trip down? Keep in mind we only have a couple of places to window shop up here. Bill's has a shooter show comming up at the end of the month. They'll have various ones to try for just the cost of the ammo. It's always nice to try before you buy. Thanks Pezhead, what are some other good gun shops to check out in the metro area?